Clean your indoor and outdoor coils. One step a Homeowner can do to keep a central air conditioner operating efficiently. Many areas of our country have trees which send out seeds and pollen that tend to clog up the outdoor condenser coils on a central air conditioner. Cottonwood trees are the worst. The outdoor coil draws air in through the coil, which can become packed with this debris. 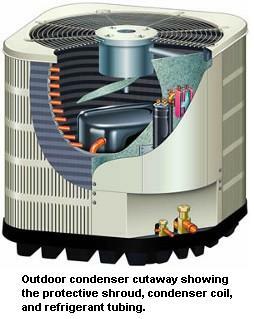 The indoor coil of a central air conditioner can become packed with debris, as well. All the air that your furnace/air handler distributes to the home passes through the indoor evaporator coil, during both heating and air conditioning seasons. If the filter in the system has not been changed regularly, or often enough, the evaporator coil can become packed with debris over time. Often people purchase a home and find, a year later, that their AC just isn't quite doing the job and that the indoor evaporator coil is almost completely plugged up. Some filtration systems are just not well sealed. The occupants service their filters regularly but still debris seems to bypass the filter(s) to little-by-little build up deposits on the coil. This problem can be addressed by your tech during your annual hvac coil cleaning session. Both the indoor evaporator coil and the outdoor condenser coils are usually composed of copper tubes and aluminum fins. Both the composition and function of these coils is similar to the radiator in your car. If the radiator in your car was plugged up, the car would overheat (not function properly). The same goes for the AC coils. A dirty coil must work harder, consuming more energy, to accomplish the cooling task. An air conditioning unit with dirty coils can consume 40% more energy than a unit with clean coils, and all the while, cooling may be reduced to a point where the unit is unable to properly cool your home. Insitute an hvac coil cleaning regimen. Regular maintenance and cleaning is the solution. Regular cleaning will increase the life expectancy and efficiency of your unit. As you have already guessed, the most important components to maintain in any air conditioner are the evaporator coil and the condenser coil. Annual service and cleaning of both components should be performed by an hvac professional. But the homeowner can help with this hvac coil cleaning maintenance by keeping the outdoor unit free of obstructions and squirting off any outdoor debris that is building up. The best cleaning of the outdoor unit is done during your annual maintenance, by a qualified tech from inside the unit by blowing pressurized air through the condenser coil from the inside out. Homeowner maintenance on the indoor evaporator coil is a much more difficult proposition. Some indoor coils are housed in a cabinet which has doors on the front for access to the coil. Basic surface cleaning can be performed by the homeowner, but thorough cleaning of this coil should be done by a qualified technician. Other evaporator coils are built into the supply air plenum which makes access impossible without cutting into the sheet metal plenum. Then the tech can set up the front of the plenum with a permanent access door for future maintenance. 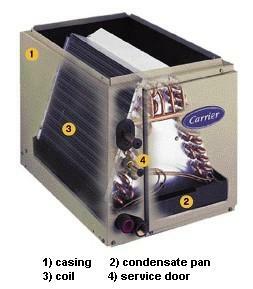 The condensate pan beneath the evaporator coil can also become contaminated with moisture, pollen and dirt. If the pan is not draining completely, this build up can eventually turn into bacteria, mold, or mildew. Then when the blower comes on, the contamination is distributed into the home's breathing air. An hvac coil cleaning maintenance program is best begun early on when the coils are still new. Usually an annual cleaning is enough, but if your AC gets heavy usage, your hvac coil cleaning program may call for maintenance twice per year. The more thorough cleaning performed by your tech should involve compressed air being blown through the copper tubing and aluminum fins, at both the indoor and outdoor units. A soft bristle brush may be used to loosen debris from the surfaces. For dirtier coils, a solution of detergent and water may be employed. Severe cases may require chemical cleaners developed specifically for this purpose. As stated earlier, some light coil maintenance can and should be performed by the homeowner, but enlisting an hvac technician annually for more detailed maintenance is best for the lifespan of your unit and also for your pocketbook. The aluminum fins on a coil serve a critical function. This is where heat transfer takes place. The fins are fragile and can be bent and damaged easily. Any maintenance routine should involve straightening and respacing any areas where the fins have been damaged. A tool is available for this purpose. Have your tech perform this service as part of his annual visit. 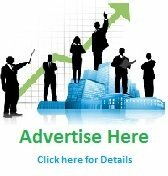 Leave "Hvac Coil Cleaning" and Return to "HOME"